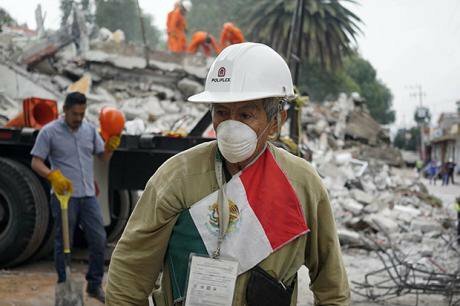 Fidel Lopez, 73, works as a volunteer after an earthquake in Mexico City, capital of Mexico, on Sept. 21, 2017. David de la Paz/Xinhua News Agency/PA Images. All rights reserved. For the second time in two weeks, Mexico was shaken by a magnitude 7.1 earthquake - before, that is, the country had time to recover from the earthquake on September 7 and Hurricane Katia’s passage over Veracruz. Something the country demonstrated in this situation was the solidarity of its people, who immediately came out to help those affected. Good gestures, however, are not enough when what is at stake is the rebuilding a country. As it is well known, Mexico’s geography makes the country prone to natural disasters – as was evidenced in recent weeks when, in a matter of just a few minutes, whole buildings collapsed. Although the country has an early-warning system, it was not effective in this case due to the immediacy of the earthquake. More than 30,000 Mexican households depend on remittances from abroad. The consequences of such a huge natural disaster are truly devastating. A few days after, the focus logically turns from relief to reconstruction, and the main factor in reconstruction is, obviously, its cost. While it is certainly true that Mexico is fully aware of the risks that its geographical position entails, this awareness is rather less evident if we analyze its disaster relief budget. When attention was still focused on the first earthquake early in September, some sectors in society began to demand an increase in the budget for rebuilding houses and temples in the affected areas. Congress was under pressure to reallocate resources from different 2018 budget lines in order to tackle the new emergencies. The answer from the Ministry of Finance and Public Credit (SHPC) was that the Fund for Natural Disasters (Fonden) - 9 billion Mexican pesos (about 482.4 million US dollars) - was "sufficient to overcome the current emergency without generating any added pressure on public finances". When this statement was released, however, Mexico had not yet been hit by the second earthquake which threw the country into a state of collapse. The Fonden was created in 1996 with the purpose of allocating resources for the protection of the life and health of the civilian population, and for the reconstruction of federal, state and municipal infrastructure affected by natural disasters. While Fonden is certainly a vital element for ensuring the citizens’ return to their daily activities, it is not the only one. According to a study published by the International Monetary Fund, remittances from abroad are an important source of income which can stimulate consumption when the economy is going through a difficult situation, such as in the aftermath a natural disaster. In fact, remittances sent by Mexicans to their families exceed the revenues of oil and the automotive industries – which comes to show how important this source of income is, on which more than 30.000 Mexican households depend. During the first half of this year, remittances broke their own historical record and reached 14 billion US dollars - great news, no doubt, but under a looming threat. Remittances are threatened by one of the measures proposed by President Donald Trump. In Mexico, about 95% of the remittances from abroad come from the United States. This great financial help for many families is now threatened by a measure President Donald Trump has recently proposed. The US president wants to fulfill, at any cost, one of his firm campaign promises - the building of a wall along the Mexican border –, and to foot the bill he has come up with the idea of imposing an additional tax on the remittances regularly sent by Mexicans. Although, for the time being, the measure is only a threat, if implemented, it could have serious consequences for Mexicans – especially now that the country needs as many resources as possible to recover from the consequences of the recent natural disasters. May Trump put his cruelty aside regarding the wall, the division and taxes, and realize that his neighbour is in dire need of help.